o 440HP with variable-geometry turbo (VGT). The Cursor 13 440HP engine delivers peak torque of 2,100Nm from 1,000 rpm and keeps it constant up to 1,525 rpm. 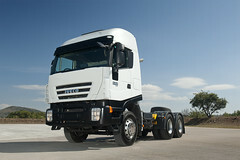 The Cursor 13 380 and 420HP engine is equipped with Iveco's Combined Engine Brake. The CEB – Combined Engine Brake is an uprated engine brake which combines two effects: decompression and braking torque. By means of a butterfly valve on the exhaust manifold, it generates sufficient exhaust gas counter pressure to slow the rotation of the engine and increase the braking force. The turbo system makes a major contribution to the performance of the engines, and offers strong acceleration, fluid power delivery and high power. It also enhances driving comfort by eliminating turbo lag, because the engine always responds immediately to inputs from the accelerator. The design of the waste-gate turbo allows high boost at low engine speeds, thereby optimising torque and fuel consumption. Once maximum turbo pressure (corresponding to high engine speeds) is reached, however, the engine and turbo must be mechanically protected.